If you are a first-time international shippers and ship your goods overseas using LCL ocean freight service, then in order to avoid possible misunderstandings of final shipping cost in your international shipping, WE STRONGLY RECOMMEND READING AND UNDERSTAND INFORMATION IN THIS WEB PAGE before you will be involved in LCL ocean freight international shipping. In general this page mostly related to international shipping of ocean freight using LCL service. LCL is an abbreviation commonly used in the international shipping industry to nominate Less than Container Load ocean freight service offered by international shipping companies (Freight Forwarders and NVOCCs), i.e. 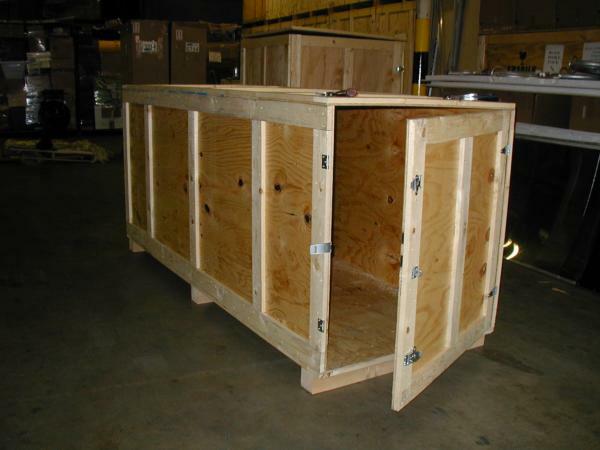 shipping boxed, crated or palletized cargo. International shipping of LCL sea freight using methods above has advantages and disadvantages. International shippers has to decide in advance, which way they are going to prepare cargo to the international shipping. 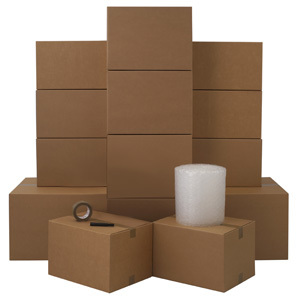 If you are using shipping boxes in your international shipping, then you may use cardboard moving boxes of different sizes. Cardboard moving boxes for your international shipment can be purchased at any local store, from moving companies or ordered online. ADVANTAGE: International shipping of loose items is the most cost-effective way to ship LCL ocean freight. It is because the total ocean freight shipping cost will be calculated as a straight sum of volumes of all shipped units in cubic meters (or cubic feet). DISADVANTAGES: International shipping of loose items using LCL ocean freight service is not the best and safe way in your import or export. Seeing that each single box or smaller shipping unit will be loaded and off-loaded into/from an ocean freight container by hand it easily could be damaged during its handling by the international ocean freight shipping company, which you use in your international shipping. Loose items can be spread out in a warehouse(s) and/or in the ocean freight container(s) and even partially lost or miss-routing during the international trip. Loose items in international shipping LCL are less protected from thieving during the international ocean shipment well. IMPORTANT TO UNDERSTEND AND REMEMBER! : If you are shipping up to 4-5 boxes, then you may request an international shipping company to ship it loose. However, if you ship many boxes OR any one shipped box or shipping unit exceeds 100 lbs (i.e. the international shipping company must use forklifts in its handling), then the international ocean carrier may decline to ship it loose. They may require to palletize or crate your loose items for the international shipping anyway, no matter either you did or did not request the international shipping company to palletize or crate your loose shipping boxes/units. Note the size of standard U.S. pallet (also known as a "skid") is 48"(1.2m) x 40"(1.0m) x 6"(0.15m). When palletizing, your shipped boxes will be stacked by the international ocean freight carrier's terminal on a pallet(s), as many as it can fit. However, height of skid should not exceed 60" (1.52m). Then the entire skid should be shrink wrapped and secured by a plastic film. However it is not strictly limited. In LCL ocean freight international shipping it is permitted to use a variety of types of pallets with different sizes and forms. Most important is that forklifts will be able to handle the pallets/skids. I.e. its bases should be accessible for pallet-jacks on two sides with a minimum clearance of 3.5". All skids on pallets for the LCL international shipping must fit into a 40' multimodal ocean freight container. If you palletize your ocean shipment, then always pay attention to wooding-packing restrictions (ISPM15 rule) in international shipping. ADVANTAGES: International shipping of palletized and shrink-wrapped cargo has much higher probability to reach destinations without damages or loss. During the international trip forklifts will safely handle palletized ocean freight. Since all shipping boxes are safely kept together in a pallet(s), then a partial lose in your international ocean freight shipment is not possible. Palletized ocean freight is much better protected from potential theft on any stage of the international shipping as well. As U.S. Freight Forwarder we always recommend to palletize your international seafreight shipment. Increasing of chargeable volume of palletized ocean freight. See below. Typically, during LCL international shipping, shippers may ask the international ocean carrier's shipping warehouses (CFSs – Container Freight Stations), which they deliver loose boxes to, to palletize the shipping boxes directly at the ocean carrier's shipping warehouse. Then international shippers should pay for the palletizing service directly to the international ocean carrier freight terminals (CFSs). Since it paid by shippers to CFSs directly at a time of delivery, then these charges will not be included in final international shipping company's freight invoice. Cost of palletizing may vary depending on the warehouse and type of used pallets from $35 to $75+ per skid (pallet) including cost of pallet. CALCULATING OF CHARGEABLE (GROSS) VOLUME IN INTERNATIONAL SHIPPING OF LCL OCEAN FREIGHT: THE LONGEST, WIDEST AND HIGHEST POINTS OF YOUR SKID WILL BE USED IN THE CALCULATION. For example: a 40 x 50 x 50 inch skid for the international ocean freight shipment would equal 1.65 gross cubic meters (or 58 gross cubic feet). Wooding packing restrictions (ISPM15 rule in international shipping): When palletizing your cargo and use wooden pallets for shipping ocean freight from or to the USA, keep in mind wooding packing restrictions in international shipping. You may find more about these wooding packing restrictions in our website in this link. Addressing and Labeling: Before palletizing of your boxes, we recommend to label two sides of ALL individual cartons/shipping units within the skid(s) whenever possible. Remove or mark through old labels. It will help to recognize your shipping boxes in event if your skid would be broken during its international ocean freight shipping. After you have palletized your cargo, label two sides of each skid. Include in the labels your consigner and consignee's contact info (i.e. names, addresses and phone numbers both at origin and destination on your international ocean freight shipment and (VERY IMPORTANT!) OCEAN FREIGHT CARRIER'S BOOKING NUMBER. DO NOT write on your shipping units anything about commodity inside of your shipping units. You will provide commodity description it in your international shipping documents: commercial invoices or valued packing lists, which will be submitted to an international shipping company used for your ocean freight shipment. Size and Weight: In international shipping, skids exceeding 2,200 lbs. or exceeding 70" in height or 119" in length or 80" in width may require a prior approval from international shipping company used for your shipment. 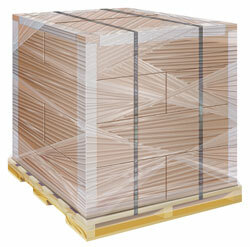 Safety when loading and stacking your shipping boxes in skids: Distribute weight evenly. Stack boxes squarely corner-to-corner to the skid's edge to maximize compression strength, but do not allow shipping boxes to hang over the skid. Keep the top of the skid flat to minimize loss or damage to cartons; do not pyramid-stack. Place angled fiberboard (angleboard) between shipping boxes to prevent crushing. Cover by a plastic film the top of skids to protect your freight from weather damage. Securing of skids: Wrap skids for the ocean freight in 70-gauge stretchwrap. Pass at least two bands (tightly secured) through the skid voids and around all cartons. If possible use steel, rayon, polypropylene, nylon or polyester strapping to band the ocean freight. Use shock-absorber connections or cushioned skids, if applicable, when bolting. Crating cargo for international shipping using LCL ocean freight service may be quite expensive. Crating of cargo for the international shipping using LCL ocean freight service would be necessary if you ship valuable and/or fragile goods something like furniture, considerable large items or certain kind of irregular or fragile commercial freight. 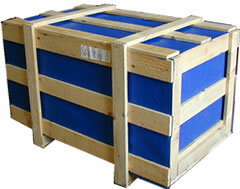 Regular or custom-made solid crates can be purchased from packing companies or ordered online. You may also using a professional packing company to crate your gods to the international shipping. As U.S. Freight Forwarder we suggest you always asking your packing company if they are familiar with packing regulations in international shipping of ocean freight including wood packing regulations. Note that crates of any sizes and forms used in international shipping by sea, same as pallets, must be forkliftable and fit into 40' multimodal ocean freight containers. IMPORTANT! : Always keep in mind wooding packing restrictions on international shipping of ocean freight. Find more about these restrictions on our website. Depending on what you ship, sometimes it is the good idea to ship international LCL ocean freight mixed. That means that you can palletize and shrink-wrap small shipping boxes, crate most valuable or fragile items and leave oversized items loose. This approach can give you peace of mind on safety of your shipped goods and save on gross chargeable volume of your international ocean freight shipment.